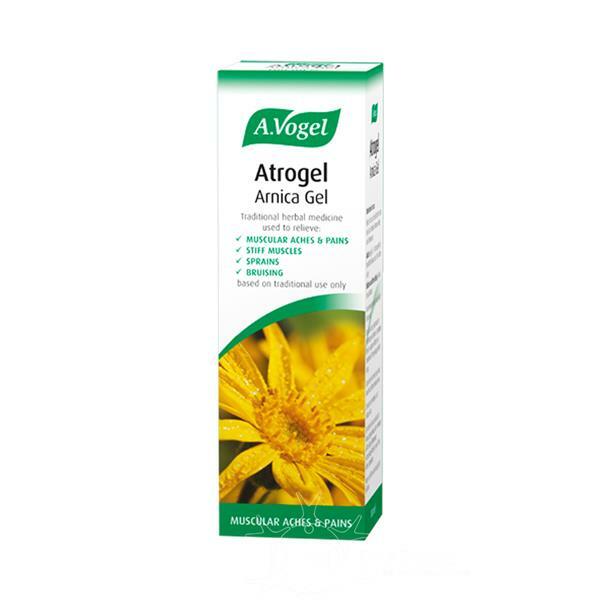 Atrogel Arnica gel may be used to relieve pain and bruising in adults, children and the elderly. Apply 2 to 10 cm of the gel gently to the affected area. Use between 2 and 4 times daily for pain relief. Discontinue the use of arnica gel if you find these side effects are troubling you. If they persist, become serious or are worrying to you, or if you notice any side effects not listed in this leaflet, talk to a pharmacist or doctor. The arnica in Atrogel is obtained from freshly harvested, organically cultivated Arnica montana. 1g of gel contains 500mg of arnica extract, equivalent (on average) to 160mg fresh arnica flowers. Other ingredients are ethanol, purified water, glycerol (derived from plants) and hypromellose (a thickening agent). The product is free from genetically modified ingredients. A. Vogel Atrogel is a herbal remedy made from extracts of fresh Arnica flowers and is an easy-to-apply non-greasy gel. It is ideal if you are looking for a treatment to relieve pain in conditions such as muscle aches or pains, stiffness or after sporting injuries. It can be used up to 4 times a day. The arnica in Atrogel is obtained from freshly harvested, organically cultivated Arnica montana. 1g of gel contains 500mg of arnica extract, equivalent (on average) to 160mg fresh arnica flowers. The product is free from genetically modified ingredients.